Contents: Preface. Part A: 1. Biological membranes architecture and function (E. Sackmann). 2. The evolution of membranes (M. Bloom, O.G. Mouritsen). 3. Polymorphism of lipid-water systems (J.M. Seddon, R.H. Templer). 4. Phospholipid monolayers (H. Mhwald). 5. 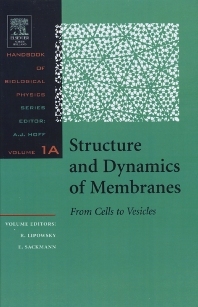 Physical basis of self- organization and function of membranes: physics of vesicles (E. Sackmann). 6. Lateral diffusion in membranes (P.F.F. Almeida, W.L.C. Vaz). 7. Molecular theory of chain packing, elasticity and lipid-protein interaction in lipid bilayers (A. Ben-Shaul). 8. Morphology of vesicles (U. Seifert, R. Lipowsky). 9. Material transport across permeability barriers by means of lipid vesicles (G. Cevc). 10. Applications of liposomes (D.D. Lasic). Part B: 11. Generic interactions of flexible membranes (R. Lipowsky). 12. Electrostatic properties of membranes: The Poisson-Boltzmann theory (D. Andelman). 13. Interaction in membrane assemblies (V.A. Parsegian, R.P. Rand). 14. Tension-induced mutual adhesion and a conjectured superstructure of lipid membranes (W. Helfrich). 15. Physical actions in biological adhesion (E. Evans). 16. Adhesion of cells (P. Bongrand). 17. Cell membranes and the cytoskeleton (P. Janmey). 18. Electroporation and electrofusion of membranes (D.S. Dimitrov). 19. Cation-induced vesicle fusion modulated by polymers and proteins (K. Arnold). Author index. Subject index. The first volume of the Handbook deals with the amazing world of biomembranes and lipid bilayers. Part A describes all aspects related to the morphology of these membranes, beginning with the complex architecture of biomembranes, continues with a description of the bizarre morphology of lipid bilayers and concludes with technological applications of these membranes. The first two chapters deal with biomembranes, providing an introduction to the membranes of eucaryotes and a description of the evolution of membranes. The following chapters are concerned with different aspects of lipids including the physical properties of model membranes composed of lipid-protein mixtures, lateral phase separation of lipids and proteins and measurement of lipid-protein bilayer diffusion. Other chapters deal with the flexibility of fluid bilayers, the closure of bilayers into vesicles which attain a large variety of different shapes, and applications of lipid vesicles and liposomes. Part B covers membrane adhesion, membrane fusion and the interaction of biomembranes with polymer networks such as the cytoskeleton. The first two chapters of this part discuss the generic interactions of membranes from the conceptual point of view. The following two chapters summarize the experimental work on two different bilayer systems. The next chapter deals with the process of contact formation, focal bounding and macroscopic contacts between cells. The cytoskeleton within eucaryotic cells consists of a network of relatively stiff filaments of which three different types of filaments have been identified. As explained in the next chapter much has been recently learned about the interaction of these filaments with the cell membrane. The final two chapters deal with membrane fusion.